Oh, boy. Yet another Venom crossover/event. We just had Venomverse in September, Venom Inc. ended last week, now it’s Poison-X, and in a few months, the Venom event will be Venomized. The first two were fun but forgettable, and wasted potential, respectively. Poison-X sounds like it could have just done Venomverse’s job of introducing the Poisons, and Venomized sounds exactly the same as Venomverse (I am so sick of saying Venom in this review already.) only without the multiverse shenanigans. Not to mention the Red Goblin in the upcoming Amazing Spider-Man “Go Down Swinging” arc. I like symbiotes as much the next guy, and I know his 30th anniversary is upon us, but I think we’re starting to cross the line of alien goo fatigue. Mild spoilers below. With that out of the way, let’s look at this by itself. Cullen Bunn is behind the Venom wheel once again. I’ve enjoyed his work with the character before, so I’m not sure what happened here. His X-Men all seem to be acting in character. What’s with Eddie? He wants absolutely nothing to do with these kids. They ask him for help investigating a problem with symbiotes (I refuse to call them Klyntar because that name is stupid and that retcon was a mistake.) and he’s just like, “nah, I’d rather just threaten to eat arms dealers.” The Eddie Brock here feels like a completely different Eddie Brock from the one I read over in the main Venom book. He doesn’t want to help until he doesn’t really have a choice because he’s on another planet with no way back. Might as well, right? I’m at least glad that his partner tells him that this is why no one likes him. And he does it in a full sentence, too. I guess that’s back to normal with no explanation. 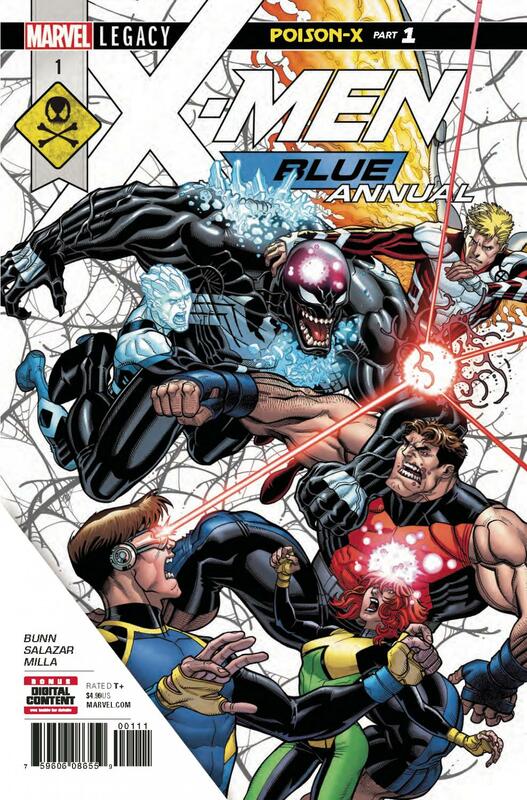 Similarly, I think this is a fine looking book…except for when Venom is around. Artist Edgar Salazar doesn’t wow me, but he does a good job depicting emotion and differentiating everyone most of the time. Jean Grey does have a sort of Benedict Cumberbatch face at one point. This is one my least favorite looks for Venom, though. I like him with big teeth that show from ear to ear (or where his ears would be). Here, it just kind of looks like he’s always awkwardly trying to smile for a picture. His skull looks shaped like a regular human’s, which I don’t think I would normally mind, but in addition to the half-assed smile, it makes for a very weird looking Venom. If he had pupils, I’d give up on the book right now. Action scenes also seem to be missing some steps. There’s occasional jumps where one more panel showing the action in between would’ve made it feel easier to follow. I did chuckle / do a double take when I noticed that when Eddie is put to sleep, his face seems to break the concrete when he falls.